Saturday provided quite a glimpse into baseball’s future. Taveras’s first homer was so majestic, it messed with the fabric of the universe: Right after the kid’s curtain call, the game went into a 47-minute rain delay. Atlanta reliever Shae Simmons, 23, didn’t have to deal with any rain in his MLB debut. All he had to contend with was protecting a one-run lead with two runners on in the eighth inning, knowing that a single Marlins hit could wipe out Atlanta’s precarious one-game lead in the NL East. Undaunted, Simmons got ahead of Jarrod Saltalamacchia 0-2. Then he snapped off a slider that’s going to give Salty nightmares for the rest of his natural life. Expect more big moments from new faces as June progresses, Super 2 concerns evaporate, and a passel of impact call-ups like Gregory Polanco, Jon Singleton, and Alex Meyer arrive. It’s Week 9 of The 30. The Astros climb out of the cellar, while the Rays continue their free fall. The Astros lost to the Orioles on Saturday and Sunday, but that blip shouldn’t detract from Houston’s prior seven-game win streak, which would have been impossible to even contemplate as recently as a month ago. Now, the biggest surprise isn’t the win streak, but that it ended with the indomitable Dallas Keuchel on the mound. Keuchel owes much of his success to a 65.4 percent ground ball rate that’s the highest for any major league starting pitcher this year; his May 19, 8⅔-inning start against the Angels included eight strikeouts, 16 groundouts, and just two outs registered through the air. He’s also shown exceptional command, ranking ninth in the AL in strikeout-to-walk rate. His platoon splits hold up, as lefties are hitting .234/.280/.325 against him compared with .224/.266/.333 for righties. He’s inducing tons of weak contact, too: Per ESPN’s TruMedia system, Keuchel has posted the third-lowest hard-hit average against among all qualified starting pitchers. He’s seventh in the AL in ERA and seventh in Fielding Independent Pitching, and while we can’t know what the future holds, nothing in Keuchel’s season stat line suggests his performance is a fluke. On Sunday, I spoke to first-year Astros pitching coach Brent Strom, who said a lot of Keuchel’s success boils down to a pitcher who’s been in the league for a couple of years finally putting it all together. While Strom credited Keuchel and fellow breakout starter Collin McHugh for fueling their own success, he also talked up the Astros’ analytical approach, noting how that’s helped the coaching staff do its job and identify talent. Plenty of other players have propelled the Astros’ recent success, especially George Springer and his crush crusade. If Houston intends to build on its May run, however, it’ll be thanks to the quality young pitchers who are producing alongside hitters like Springer and eventually Singleton, Carlos Correa, and others. The Astros are still in last place in the AL West, but coming off three consecutive 100-loss seasons, these little sprouts of optimism are encouraging. You know what they say about the ones in the middle. Baltimore is the lone team in today’s quartet for which youth isn’t a dominant theme. If anything, the Orioles thumbed their noses at the future to land their best player this year. There were many reasons to dislike Nelson Cruz as a free agent when he hit the open market at the end of last season. He was 33 years old. He’d struggled with injuries earlier in his career. The speed he’d once boasted was long gone. He was one of the worst defensive outfielders in the league, a liability at any position other than DH. He made too many outs, posting a lukewarm .319 on-base percentage in his three most recent seasons. Even his power, the main source of his value, was in question: He’d averaged 27 homers a year since 2009, but had done so in the AL’s best hitters’ park. Moreover, the long balls were no guarantee following his PED suspension. Signing him required awarding the Rangers a compensatory draft pick since they’d made a qualifying offer. And his initial asking price was a substantial four years and $75 million, according to one report. As other teams spent their money elsewhere and refused to sacrifice draft picks for non-stars, the O’s waited out the market. On February 24, a few days after pitchers and catchers had reported to spring training and several weeks after nearly everyone else had lost interest, GM Dan Duquette pounced, signing Cruz to a one-year, $8 million deal. Because that move came five days after Baltimore inked Ubaldo Jimenez to a multiyear contract, Cruz actually cost the Orioles a second-round pick instead of a first, since Jimenez also carried a compensatory spot. Jimenez has been erratic this year, and Baltimore might one day regret not being able to pick until no. 90 in this week’s draft. However, no one can argue with the value Cruz has delivered. Not even one bit. Before leaving Sunday’s game with a left hand contusion,2 Cruz had been setting the world on fire, smashing eight homers in the previous 14 days to rank as baseball’s hottest hitter over that stretch. That hitting tear hiked his home run total to 20, tops in the majors and only four behind the entire Kansas City Royals roster. Some of those homers have been wall-scrapers, with Cruz tied for second in the majors with six round-trippers that barely cleared the wall, per ESPN’s Home Run Tracker. But the majority of Cruz’s blasts have been big ones, as he’s averaging 404 feet per home run … and often hitting ’em considerably farther. It’s smart to bet the under on a guy continuing at this pace no matter who’s doing it, but doubly so for a player like Cruz, who’s never done anything like this before despite good career power numbers. Nonetheless, there are reasons to be optimistic about the rest of the Orioles’ season, from Manny Machado being a lock to improve on his awful post–disabled list numbers3 to Kevin Gausman being likely to get called up soon, given his 2.40 ERA and strikeout-an-inning pace at Triple-A and Baltimore’s lack of current impact starters. Hell, we might even see Johan Santana back in the big leagues soon.4 And given what it costs to land real talent on the open market these days, it’s easy to argue that Cruz has earned his keep no matter what happens the rest of the way. Six National League teams (and the Yankees) knocking on the door. 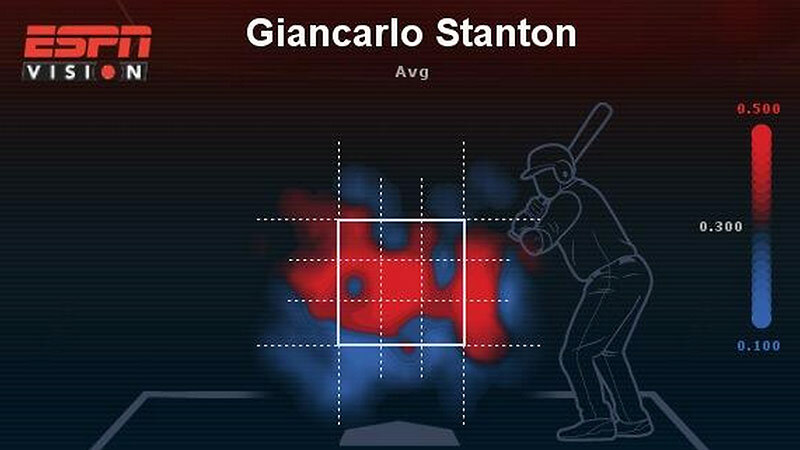 The National League home run leader isn’t a huge surprise based on sheer talent, as Giancarlo Stanton averaged 32 homers from 2011 through 2013 despite playing his home games in one of the worst parks for home run hitting. His power numbers were even more impressive on a per-game basis: Prorate his homer totals over 162 games, and Stanton becomes a 40-homer guy. And while his homers came with too many strikeouts in the past, Stanton has developed into an excellent all-around hitter. His plate discipline numbers show fewer swings and misses and less falling behind 0-1 than ever before. He’s hitting more line drives, fewer grounders, and fewer infield popups than usual, all good signs. Stanton is 6-foot-6 and has hellacious strength and long arms, so throwing him a pitch out over the plate (or up) is asking for trouble. The most amazing thing is that despite cranking 133 career homers (and counting) and establishing himself as one of the scariest hitters in the game, Stanton is still just a kid. He’s 24 years old, and he’s Marlins property through 2016. And while every winning team’s fans have conjured up some elaborate trade rumor, Stanton might be able to stay put and still play for a contender: Though they just got swept at home by the Braves, the Marlins sit just three games out of first place. And while their 21-year-old ace, Jose Fernandez, is out for the year, their next young pitching star might get called up any day now: 22-year-old Andrew Heaney struggled Sunday at the pitcher’s death trap that is Colorado Springs, but he’s been tremendous this year, posting a 2.35 ERA and 4-to-1 strikeout-to-walk rate at Double-A and 14 strikeouts to no walks in two Triple-A starts before yesterday’s blowup. Even if they don’t quite break through this year, the Fish can go into 2015 with Stanton, Fernandez, Heaney, Christian Yelich (22), Marcell Ozuna (23), Nathan Eovaldi (24), and Henderson Alvarez (24),6 knowing they have more potential impact players under 25 on the roster than any other NL team, and even more help on the way. You won’t find any negatives among these run differentials. Coming off an 88-loss season marred by injuries and suspension, the Brewers didn’t get much hype heading into 2014. When they did get attention, it usually centered on Ryan Braun’s return. When people talked about the offense outside of Braun, they focused on what Carlos Gomez, Jonathan Lucroy, Jean Segura, and Khris Davis might do after breakthrough campaigns. And when they talked about the rotation, they focused on Matt Garza’s new four-year contract; Yovani Gallardo’s chances of regaining his prior ace form of old; Kyle Lohse’s rock-solid late-career performance; 7 or, in the nerdiest circles, Marco Estrada being a command master who might be poised for a breakout of his own. No one talked about Wily Peralta. By the numbers, that made sense. Peralta posted a 4.37 ERA last year, walking too many batters and generally struggling to throw the ball where he wanted it. Saturday’s game, a six-run debacle against the Cubs, resembled that Peralta. It was also the only outlier in what’s been an excellent, and still mostly ignored, season. The 25-year-old right-hander allowed two earned runs or fewer in nine of his first 10 starts this season; the only time he allowed more was a three-run April outing, also against the Cubs, in which Peralta still lasted seven innings, struck out six batters, and walked just one. He owned a 2.12 ERA entering Saturday’s rough start, the sixth-lowest mark for any qualified starting pitcher to that point. He’s slashed his walk rate by more than one per nine innings and ranks among the league leaders in ground ball rate. Watch Peralta when he’s on, and it’s easy to explain his success. You can count the number of starters who throw 96 mph sinkers on one hand … and his slider’s the superior pitch. When a team’s fifth starter can do that, there’s a good chance its playoff hopes are real. Ultimate Zone Rating has the Astros as the worst defensive team in the American League. Baseball Info Solutions’ Defensive Runs Saved stat isn’t as harsh, ranking Houston’s D 10th out of 15th, albeit a unit that’s cost the team’s pitchers a few more runs than it’s saved. X-rays were negative and he’s currently day-to-day. He might have started doing just that with a 2-for-4 Sunday performance that included his first career grand slam. Happy Johan No-Hitter Day, Mets fans! That follows a teamwide trend, as the Marlins have been the NL’s second-best offensive team at home, but just the eighth-best on the road. And that’s not counting 24-year-old second baseman Derek Dietrich, who’s hitting an impressive .252/.349/.441. Lohse’s latest gem came Sunday, when he fired a three-hit shutout at the Cubs, striking out six, walking none, and needing just 93 pitches and two hours and 18 minutes to get through nine innings. Or as Indians blogger Jason Lukehart likes to call it, a #Maddux.